Paul Reed Smith announces the release of a new Brushstroke 24, a 24-fret electric guitar available as a limited edition. The PRS Brushstroke is based on Paul’s Guitar, but unlike the latter, it features 24 frets (22 on the original), “Brushstroke” Bird inlays and a tremolo bridge. Only 200 Brushstroke 24 guitars will be available worldwide. 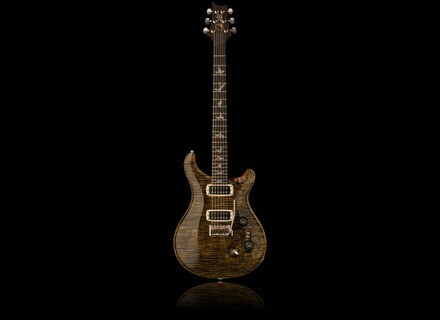 More info at prsguitars.com. The PRS Archon in 50W versions Archon, the valve guitar amp that PRS launched earlier this year, is now available in a 50W version, in both head and combo editions. The PRS S2 guitars in semi-hollow versions After the limited edition of the Custom 24, Paul Reed Smith introduces semi-hollow versions of 3 of his S2 Custom 22, Mira and Singlecut guitars. PRS introduces two SE basses Paul Reed Smith debut the SE Bass Series with two Kestrel and Kingfisher models.